It’s a tricky thing, in these post-gendered times, to project an unmitigatedly masculine image. Even if one successfully dresses in denim and leather, drives a muscle machine, and dominates the playground hoops, ones locution can undermine the butch effect for which one strives. Earth Bath – A grave. Gullyfluff – The waste—coagulated dust, crumbs, and hair—which accumulates imperceptibly in the pockets of schoolboys. Half-mourning – To have a black eye from a blow. As distinguished from “whole-mourning,” two black eyes. 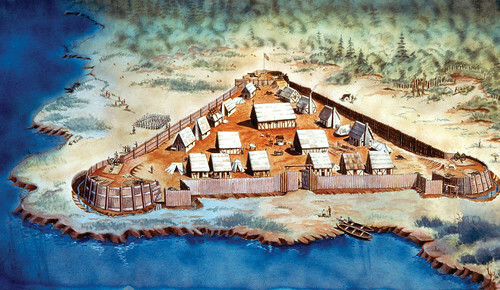 Hogmagundy – The process by which the population is increased. Ladder – “Can’t see a hole in a Ladder,” said of any one who is intoxicated. 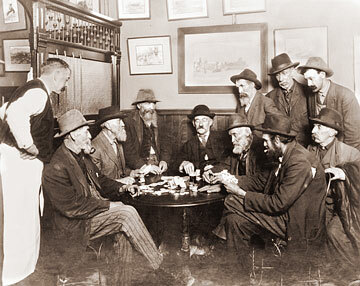 It was once said that a man was never properly drunk until he could not lie down without holding, could not see a hole through a Ladder, or went to the pump to light his pipe. Scandal-water – Tea; from old maids’ tea-parties being generally a focus for scandal. 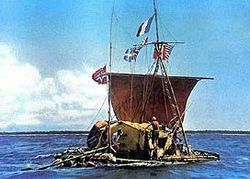 As we twirl our moustaches, we might recall that it was on this date in 1947 that Thor Heyerdahl and five crew mates set out from Peru on the balsa raft Kon-Tiki to prove that Peruvian natives could have settled Polynesia.